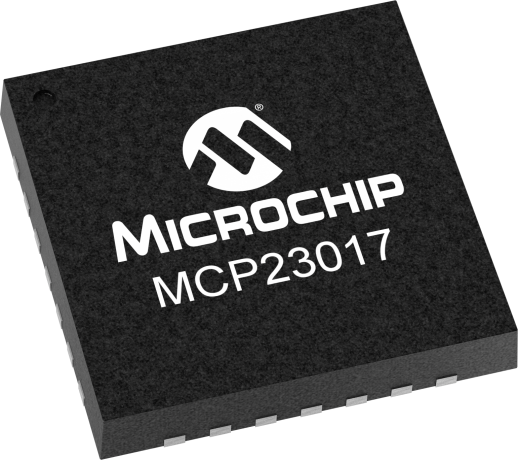 The MCP23X17 consists of multiple 8-bit configuration registers for input, output and polarity selection. The system master can enable the I/Os as either inputs or outputs by writing the I/O configuration bits (IODIRA/B). The data for each input or output is kept in the corresponding input or output register. The polarity of the Input Port register can be inverted with the Polarity Inversion register. All registers can be read by the system master. 1. When any input state differs from its corresponding Input Port register state. This is used to indicate to the system master that an input state has changed. 2. When an input state differs from a preconfigured register value (DEFVAL register). The Interrupt Capture register captures port values at the time of the interrupt, thereby saving the condition that caused the interrupt. The Power-on Reset (POR) sets the registers to their default values and initializes the device state machine. The hardware address pins are used to determine the device address. The GPIO Expander Keypad and LCD Demo Board is designed to demonstrate the use of the MCP23S08/17 (SPI interface) and the MCP23008/17 (I2C interface) devices in a keypad and LCD example. The MCP23X17 (16-bit) devices interface to a 2x16 LCD module and the MCP23X08 (8-bit) devices interface to a 4x4 keyed matrix. The MCP23X17 16-bit GPIO Expander Evaluation Board demonstrates simple input/output functionality of the MCP23017 (I2C interface) and the MCP23S17 (SPI interface). The system demonstrates the simplicity of monitoring four pins configured as inputs and applying a predetermined pattern on LEDs connected to the remaining 12 pins configured as outputs.